A capacity 32-car grid will take on the UK’s fastest circuit next weekend (7/8 May), as the Dunlop MSA British Touring Car Championship visits Thruxton in Hampshire for rounds 7, 8 and 9 of the season. The 2016 campaign kicked off in emphatic fashion with six different drivers having won the six breathless races so far, including five different marques that have reached the top step of the rostrum. Honda is the only manufacturer to have won twice while BMW, Ford, Mercedes and Toyota machinery has also triumphed. Thruxton will hold an altogether different challenge to those posed at the Brands Hatch curtain-raiser and Donington Park last time out, however, as wheel-to-wheel racing at up to 160mph is not for the faint hearted. In a bid to manage the abrasive track surface and the eye-watering speeds produced by flame-spitting BTCC cars, title sponsor and official tyre supplier Dunlop has to construct a bespoke harder compound tyre for this event only, providing yet another reason that sets Thruxton apart from any other venue on the calendar. A huge crowd is set to descend on the banks and grandstands of the flat-out famous Hampshire circuit while many, many more will watch the unmissable action live on ITV4. No fewer than ten drivers have already stood on the BTCC podium from just the opening two events, and there’s little sign of a clear pattern emerging among the front-runners at this relatively early stage of the campaign. The highly competitive nature of the series, combined with the high-speed and abrasive nature of the Thruxton tarmac, means the form book may have little or no use next weekend either. The no-holds-barred and unpredictable racing provided by the Dunlop MSA British Touring Car Championship is not only what the fans love but cements its position as the country’s premier motor sport series. Halfords Yuasa Racing duo Gordon Shedden and Matt Neal have starred at both Brands Hatch and Donington Park, with the latter leading the championship from his team-mate, but the multiple champion squad have not had it all their own way. Tom Ingram flew the flag for the ever-growing number of young talents in the series as the Speedworks Motorsport driver blasted his Toyota to a first ever pole position and race victory in the Brands Hatch season opener. Adam Morgan’s Mercedes was another to win at the legendary Kent circuit. Ford and BMW joined the front-running battle at Donington as experienced drivers Mat Jackson and Rob Collard took a victory apiece for Motorbase Performance and West Surrey Racing respectively. While Shedden and Neal have only added one win each to their respective tallies, it is their relentless consistency currently setting them apart from the chasing pack. Former champions Andrew Jordan, Jason Plato and Colin Turkington have yet to show their hand, although one of them in particular will fancy his chances next weekend. Jordan has taken pole position on three of his last four visits to the UK’s fastest track, which is also the venue of Motorbase’s only one-two finish. Now driving for the Kent outfit, the 2013 BTCC champion will expect to be challenging in his ballast-free Ford Focus around the fast and thrilling Thruxton. Things may not be so straightforward for Plato and Turkington, however, as both continue developing the all-new entry from iconic Japanese marque Subaru. There’s little doubting the credentials of its driver line-up, nor the potential of the Levorg model, but the Thruxton weekend may come just a little too soon for the Team BMR-run squad. With more than a dozen contenders for outright wins it’s a case of trying to predict the unpredictable, but what is for sure is that the BTCC always provides the highest levels of entertainment along the way! This may be Rob Collard’s best opportunity to win at his home circuit for the first time, and the 2016 season could also mark the Eversley driver’s greatest chance of claiming a first ever BTCC title. A victory at Donington Park in mid-April has put him within touching distance of the championship summit and the West Surrey Racing BMW seems to be performing better than ever. The squad’s trio of 1-Series’ conquered all before them in 2014 before a fast but inconsistent campaign last year curtailed the team’s challenge. Now WSR seems to be firing on all cylinders again and Collard is hopeful of home success. “I can’t wait to get to Thruxton – one of the best circuits in the country,” he said. “It boasts the highest speed corners you can drive in the BTCC. We take Church corner at 140mph and reach speeds of around 155mph at other parts of the track. It’s a very, very fast and exciting circuit to visit and an absolute pleasure to race there. MG’s Josh Cook is another who will hope to shine as the Bath driver looks to maintain his eye-catching 2016 form, while both Dorset’s Alex Martin and Fleet’s Daniel Welch plan to continue their rise up the BTCC order. 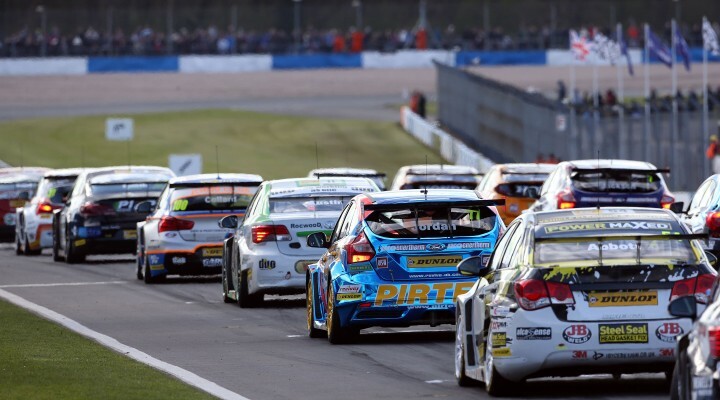 All three BTCC races on Sunday, 8 May – and many of the day’s other races – will be broadcast live and in high-definition on ITV4. Those in attendance at the circuit can stay in touch with the commentary and live timing from every session, available on the btcc.net Live Zone throughout the weekend. The support series on the TOCA package are also guaranteed to entertain with a total of 12 races set to wow the crowds. Discounted advance tickets are on sale from just £11 for Saturday, 7 May and £26 for Sunday, 8 May, with weekend tickets including Paddock Pass available for £38. They can be purchased online at http://www.thruxtonracing.co.uk/racing/btcc or by calling 01264 882200 (Option 1). Accompanied children aged 15 and under are admitted free. In a unique promotion, anybody that buys (or has already bought) an advance race day or race weekend ticket will be entered into a competition to wave the chequered flag at the end of the first race. The winner must be over 17 years of age. Advance tickets will remain on sale online and over the phone until 3pm on Wednesday, 4 May, after which they will be available from the BARC Ticket Office at Thruxton until 3pm on Friday, 6 May. Any tickets ordered from Friday, 29 April onwards will incur a special delivery charge of £5.95 per order. Full price day tickets can be purchased on the gate; weekend tickets are only available in advance. For more information on Thruxton’s race meetings and driving experiences, visit: http://www.thruxtonracing.co.uk/.